Definition at line 116 of file util-hashlist.c. References HashListTable_::array, HashListTableBucket_::bucknext, HashListTableBucket_::data, HashListTable_::Hash, HashListTable_::listhead, HashListTableBucket_::listnext, HashListTableBucket_::listprev, HashListTable_::listtail, SCLogDebug, SCMalloc, HashListTableBucket_::size, and unlikely. Referenced by DetectAddressMapFree(), DetectBufferTypeGetByIdTransforms(), DetectBufferTypeMaxId(), DetectParseDupSigHashFree(), DetectPortHashAdd(), HashListTableGetListHead(), MpmStoreInit(), PrefilterInit(), SigGroupHeadHashAdd(), and VarNameStoreSetupStaging(). Definition at line 237 of file util-hashlist.c. Definition at line 82 of file util-hashlist.c. References HashListTable_::array, HashListTable_::array_size, HashListTableBucket_::bucknext, HashListTableBucket_::data, HashListTable_::Free, and SCFree. 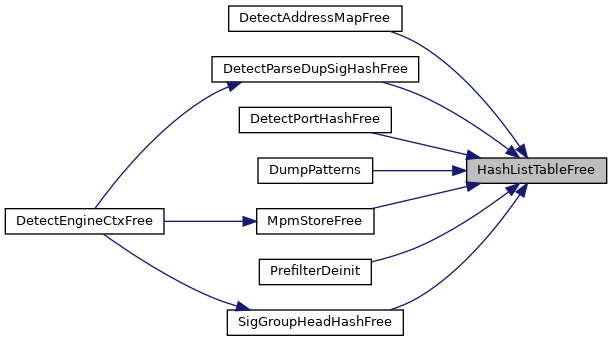 Referenced by DetectAddressMapFree(), DetectBufferTypeMaxId(), DetectParseDupSigHashFree(), DetectPortHashFree(), HashListTableGetListHead(), InspectionBufferApplyTransforms(), MpmStoreFree(), PrefilterDeinit(), and SigGroupHeadHashFree(). Definition at line 273 of file util-hashlist.c. Definition at line 290 of file util-hashlist.c. 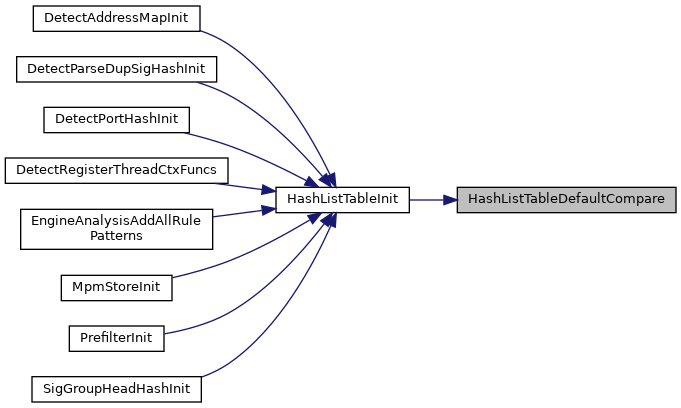 References HashListTable_::Hash, HashListTableAdd(), HashListTableFree(), HashListTableGenericHash(), HashListTableGetListData, HashListTableGetListHead(), HashListTableInit(), HashListTableLookup(), HashListTableRemove(), HashListTable_::listhead, and HashListTable_::listtail. Referenced by HashListTableGetListHead(), InspectionBufferApplyTransforms(), MpmStoreReportStats(), PacketCreateMask(), PrefilterInit(), SCProfilingPrefilterInitCounters(), and VarNameStoreSetupStaging(). Definition at line 35 of file util-hashlist.c. References HashListTable_::array, HashListTable_::array_size, HashTable_::Compare, HashListTable_::Compare, HashTable_::Free, HashListTable_::Free, HashTable_::Hash, HashListTable_::Hash, HashListTableDefaultCompare(), HashListTable_::listhead, HashListTable_::listtail, SCFree, SCMalloc, and unlikely. 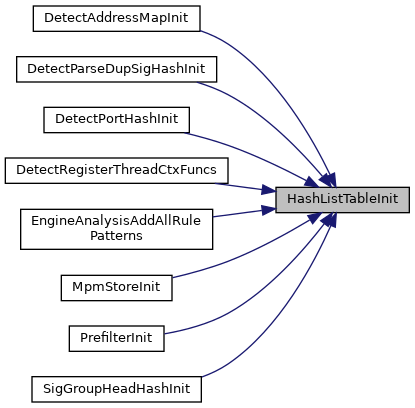 Referenced by DetectAddressMapInit(), DetectBufferTypeMaxId(), DetectParseDupSigHashInit(), DetectPortHashInit(), HashListTableGetListHead(), InspectionBufferApplyTransforms(), MpmStoreInit(), PrefilterInit(), and SigGroupHeadHashInit(). Definition at line 248 of file util-hashlist.c. References HashListTable_::array, HashListTableBucket_::bucknext, HashListTable_::Compare, HashListTableBucket_::data, HashListTable_::Hash, SCLogDebug, and HashListTableBucket_::size. Referenced by DetectAddressMapFree(), DetectBufferTypeGetByIdTransforms(), DetectBufferTypeMaxId(), DetectParseDupSigHashFree(), DetectPortHashLookup(), HashListTableGetListHead(), MpmStoreInit(), PrefilterInit(), SigGroupHeadHashLookup(), VarNameStoreLookupById(), and VarNameStoreLookupByName(). Definition at line 108 of file util-hashlist.c. Definition at line 501 of file util-hashlist.c. Definition at line 157 of file util-hashlist.c. References HashListTable_::array, HashListTableBucket_::bucknext, HashListTable_::Compare, HashListTableBucket_::data, HashListTable_::Free, HashListTable_::Hash, HashListTable_::listhead, HashListTableBucket_::listnext, HashListTableBucket_::listprev, HashListTable_::listtail, SCFree, SCLogDebug, and HashListTableBucket_::size. Referenced by HashListTableGetListHead(), and SigGroupHeadHashRemove().